Update: on 11 February, after a weeklong strike, the museum and CUPE 15 agreed on a new four-year contract, retroactively applied to July 2017. 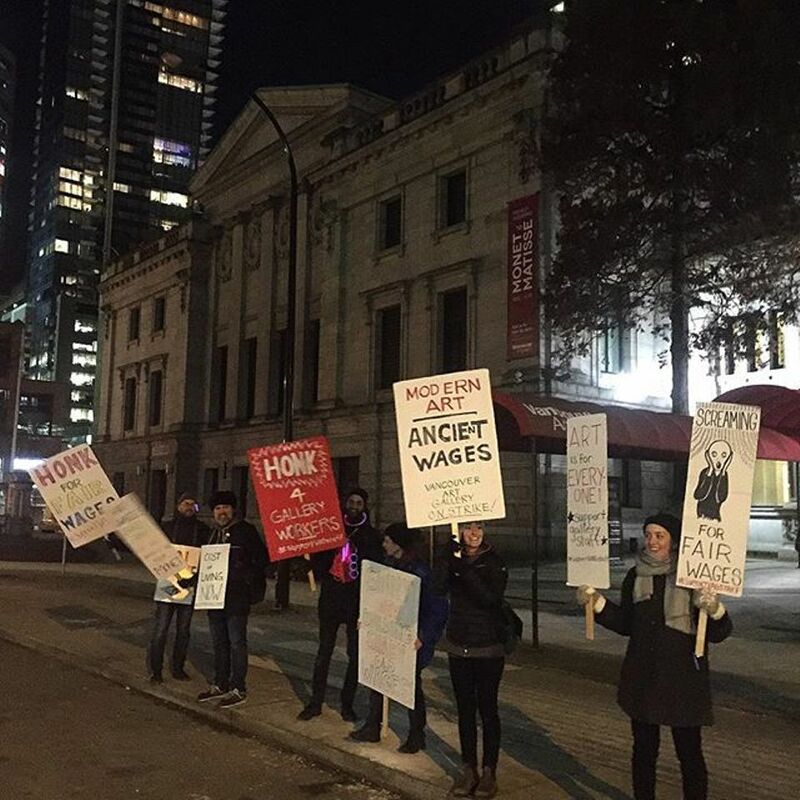 Nearly 200 unionised employees of the Vancouver Art Gallery (VAG) are on strike today (6 February) for a second day in a row following a breakdown in negotiations with management after eight months of talks over wages and scheduling. It is unclear when they will return to work, but the gallery remains open to the public with a skeleton staff. The striking workers represent 191 of 213 staff across all sectors of the museum, including curatorial, security and visitor services, and have not had a contract since summer 2017. At a demonstration in front of the museum, strikers carried placards reading “Show me the Monet”, presumably referencing the upcoming exhibition French Moderns: Monet to Matisse, 1850-1950, due to open on 16 February. It is currently unclear if the show’s scheduling will be affected. “We are taking things day by day,” says a VAG spokeswoman. Other signs said “Modern Art, Ancient Wages”, a slogan popularised during labour demonstrations at the Museum of Modern Art (MoMA) in New York last year. Similarly to MoMA, where labour disputes coincided with a major building project, the VAG has a decade-long plan for a new C$350m building designed by the Swiss architects Herzog & de Meuron. The museum revealed the final design for the delayed project on 23 January and a C$40m gift from the Chan family, local philanthropists. The union received an offer the next day, which was “poor timing to say the least”, says Warren Williams, the president of the Canadian Union of Public Employees (CUPE 15), which represents VAG employees and a total of around 7,000 workers in Vancouver. He calls the offer “an insult”. “The wage proposal currently on the table, [a] 4.75 percent raise over three years, is comparable to many recently ratified collective agreements in the region, including the Museum of Vancouver and Emily Carr University,” says the VAG spokeswoman. The union, however, says that wages fail to keep pace with inflation and fall far short of addressing the very high cost of living in Vancouver. Based on a 2017 tax return as reported by the Pacific Association of Artist-run Centres, which publicly supports the striking workers, 202 of 212 of VAG staff earn less than C$80,000 per year, while the director’s salary was C$350,000. Overtime is another point of contention in the proposal, according to Williams. “The issue is how management is allocating the staff,” he says. “A curator may say it will take 20 days to install a show, and the VAG will say, ‘no, it takes 13 days’. Then, when overtime kicks in, [the gallery management] cry foul.” Proposed changes would also eliminate a nine-day fortnight schedule, which allows employees to work 70 hours over a nine-day period rather than a five-day work week, for new full-time employees.